Cumprimente o seu guia no centro de Barcelona e ouça um briefing de segurança abrangente antes de subir na sua bicicleta elétrica. Ao contrário de outras bicicletas, estas modernas máquinas dispõem de um motor elétrico que permite pedalar com o mínimo de esforço. Vista seu capacete de proteção e explore as vistas espetaculares da cidade. Comece com uma visita à Catedral de Barcelona, a fim de absorver a extravagância gótica da estrutura; observe as temíveis gárgulas e entalhes intrincados que decoram o exterior, depois passe pelo distinto Arco do Triunfo a caminho da Praça de Touros Monumental. Saiba mais sobre a controversa expressão cultural das touradas e depois dirija-se à beleza botânica do Parc de la Ciutadella, um lugar saudado como o pulmão verde de Barcelona. Passeie pela vegetação deslumbrante do parque até chegar em El Born, um dos bairros mais vibrantes e animados da capital da Catalunha. Continue até La Sagrada Familia, uma construção considerada a jóia da coroa arquitetônica de Barcelona, e explore durante 1,5 horas de tempo livre. Use o acesso prioritário passado para navegar longas filas no hall de entrada lotado, em seguida, mergulhe na requintada excentricidade do interior. Após uma exploração completa, suba de volta na sua bicicleta e capture fotografias fabulosas de pontos de referência como La Pedera e Caso Batlló, se o tempo permitir. Dê adeus ao seu guia e grupo no ponto de partida original da excursão e continue explorando independentemente, se desejar. Mabel was our guide and her pleasant demeanor and attentiveness were essential to our tour! Ask for her if you get the chance to take this tour. Got to a lot of Barcelona including bits of the Gothic Quarter, Parc de la Ciutadella, and the Arc de Triompf before getting to Sagrada Familia this is where the electric bikes paid off!, then on to Casa Mila and another stop. Started about 9-10 done by 1-2 in time for lunch! 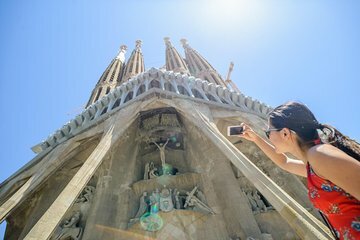 As with most tours, we'd have loved a little more time in Sagrada Familia and the chance to actually tour Casa Mila, but for the price and the e-bike going up the hill to Sagrada Familia, it was well worth it! Great experience. Guide was really helpful and knowledgeable. Sagrada Familia was beautiful. Only minus was trying to find the bike hire shop! This tour is fabulous ! So much fun ! And you see so much of Barcelona . Our tour guide was very good as well . Would definitely do this tour again ! We did get lost several times trying to find the office . There are worse things to happen to you than getting lost in Barcelona ! My husband and I toured Barcelona by Electric Bikes with our amazing tour guide Júlia. She was extremely knowledgeable of the area and it’s history. She was very cautious with our ride through the streets of Barcelona. The inside of La Familia Sagrada was Amazing! Our favorite day of our vacation!! We had a wonderful time. Our guide Monserrat was great, she gave us a lot of interesting information and was pleasure to be with. We enjoyed biking and seeing a lot of places of interest. Highly recommended trip. Our guide was awesome ... was so much fun riding around Barcelona .... we loved our experience so much we immediately booked another bike tour for the following afternoon! This was so fun! Our guide was very knowledgeable and fun to to talk to. It was nice seeing areas of Barcelona we would not gone to. Also getting the history of the city and architecture was very interesting. It was also great skipping the line at the Sarada Familia. We enjoyed visiting the Sagrada Familia and our guide gave us plenty of time to see this amazing Church. We would do this tour again. Fantastic ride to Sagrada Familia - wish it were longer! Our guide was knowledgable and very friendly, and she looked after us - 10 bikers in Barcelona! Getting to the highpoint skip the line at Sagrada Familia was easy and fun learning about the city's colourful past. The Sagrada Familia is such a spectacular sight, Gaudi was a genius. On the way back we stopped at Casa Mila and Casa Batllo, fantastic ride that will not disappoint! We had 9 in our group on the e bikes and Manuel our guide did a great job showing us around the city. He has an excellent local knowledge and spoke excellent English and engaged with the group easily. The bikes were in good order and the 4 hours passed very quickly.